0 Comments Published by KL Ocs Kid on Monday, May 14, 2007 at 9:22 AM. First team players returned after the defeat at Fulham last week, but Pepe Reina wasn’t risked with a neck injury - and with Dudek injured also, young Daniele Padielle made his debut in goal. 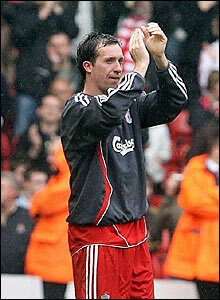 Robbie Fowler captained the side on his final Anfield appearance. Robbie Fowler’s final game at Anfield ended with a penalty at The Kop end - 2 minutes after the legendary striker was substituted. Harry Kewell put the penalty away to bring the Reds back level for a second time in the match. Arsenal’s 0-0 draw at Portsmouth means Liverpool have finished third in the Premiership. Liverpool striker Robbie Fowler’s last league game for the club ended in a draw with Charlton as the Reds claimed third place in the Premiership. Fowler’s farewell started in disappointing style as Matt Holland’s six-yard shot bobbled in. Zheng Zhi missed two glorious chances for the visitors and they paid the price when Xabi Alonso slotted in. Darren Bent volleyed in for Charlton before Harry Kewell converted a penalty just after Fowler’s substitution. Fowler, whose contract runs out in the summer, was made captain for the game and he was greeted rapturously as he led the Reds out. But Charlton showed little regard for the occasion as they made Javier Mascherano pay for a misplaced pass in midfield by going on to score through Holland. It should have been level when Addicks central defender Madjid Bougherra slipped and Alvaro Arbeloa had a free run on goal. The Spaniard seemed in two minds as to whether to shoot or the square the ball to Fowler and ended up sidefooting wide of goal. Liverpool have a Champions League final to prepare for on 23 May and their minds already seemed distracted by that game as they put in a lacklustre performance. The visitors were already relegated going into the game and were gifted several chances to end their seven-year spell in the Premiership on a positive note. Ambrose scuffed a shot when unmarked before Bent felt he should have had a penalty for a Jamie Carragher push. Bent then beat the offside trap and crossed into the six-yard box and, after the Reds failed to clear, Song saw shot was cleared off the line by Steve Finnan. China’s captain Zheng had two gilt-edged chances after the break but dinked a shot wide when one-on-one with Padelli and then headed wide from six yards. Alonso equalised when he sidefooted in after Dirk Kuyt had nodded a Kewell cross back into the Spaniard’s path. Kewell struck the post and Fowler failed to take a chance before Bent volleyed in and Alexandre Song hit the foot of the post for the visitors in a rousing finish. Fowler could have made a fairytale finish after he was found unmarked at the far post by Kuyt but he skied a shot from close range. He was substituted late on and was given a standing ovation but was left ruing his exit as Liverpool were awarded a penalty for a Bougherra handball and Kewell stepped up to score. The whole of Anfield wishes Fowler hadn’t been subbed until 2 minutes later!